People always ask me, "How do you do it? ", and my answer is typically pretty short and simple. However, when Janet Pelz and I sat down to discuss this topic, it lead to a long talk which seemed to be between long lived friends. Janet is an inspired writer/journalist/blogger who enjoys talking to women who daily, battle adversity head-on. Her blog, How Does She Do It, dives into the lives of many local women who have left their "normal" lives, some willing, others not, for a new path. Whether leaving a financially stable job to start a non-profit or battling disease, these women are a unique bunch that I like to call, "gamers". In basketball, a gamer is someone who rises to the challenge of each game in spite of their deficiencies in preparation, lack of knowledge about their opponent, or general ability to fight. Granting all of these, a gamer rises to the challenge each time, putting up triple-double sort of numbers. Not worriying how tall the mountain to climb, how much money she won't have, or the statistical odds of survival, a gamer rises to the occasion. If this type of a person piques your interest, check out my link above. Read my story as well as about the other courageous women. I have to let all of you faithful readers know about an amazing woman. 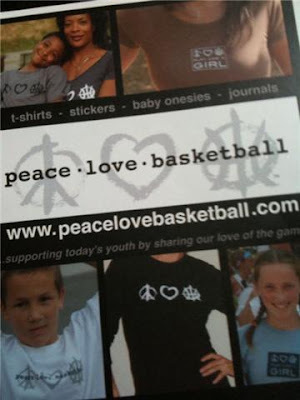 Sonya Elliot, owner of Full Court Design and founder of Peace-Love-Basketball, has an amazing story of tragedy, strength, faith and perserverence. I cant recapsulate the story with the same elegance she has shown, so I won't even try. However, I want to encourage everyone to check out the link highlighted above. She is strong. She is beautiful. She is smart. She is selfless. She is kind. She is woman. She is the type of person you want to have in your corner in times of need. She is also the lady you want to shop with because her style is evident by the clothes she designs. Check her out for yourself....you will love her inspiration and style. Her is a snipit of her ad. I am telling you, it does not do her or her story justice. Take a minute and check it out for yourself. Thank you, Sonya, for caring about me. Sonya was graceful enough to send a few shirts my way and I have a hard time taking them off. I am currently wearing the black long sleeve despite the chili stain from lunch earlier. Sonya has also offered to partner with the Melissa Erickson Foundation on a t-shirt design for March Madness. Stay tuned to this blog or check out hers for more details.